To calculate an ISS, take the highest AIS severity code in each of the three most severely injured ISS body regions, square each AIS code and add the three squared numbers for an ISS (ISS = A2 + B2 + C2 where A, B, C are the AIS scores of the three most injured ISS body regions). The ISS scores ranges from 1 to 75 (i.e. AIS scores of 5 for each category). If any of the three scores is a 6, the score is automatically set at 75. Since a score of 6 ("unsurvivable") indicates the futility of further medical care in preserving life, this may mean a cessation of further care in triage for a patient with a score of 6 in any category. ^ Baker, S.P. ; B. O'Neill, W. Haddon Jr., W.B. Long (1974). "The Injury Severity Score: a method for describing patients with multiple injuries and evaluating emergency care". The Journal of Trauma (Lippincott Williams & Wilkins) 14 (3): 187–196. ^ a b Copes, W.S. ; H.R. Champion, W.J. Sacco, M.M. Lawnick, S.L. Keast, L.W. Bain (1988). 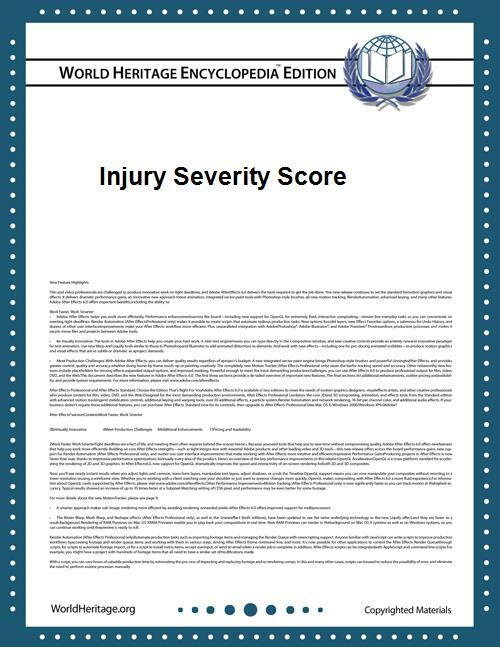 "The Injury Severity Score revisited". The Journal of Trauma (Lippincott Williams & Wilkins) 28 (1): 69–77.